Sometimes in Tunisia you just need help getting things done. 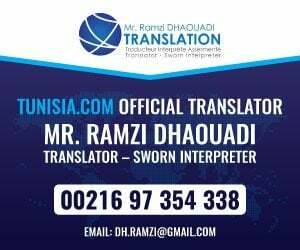 As a certified translator, I am legally vetted and cleared by the ministry of justice in Tunisia to translate and interpret for customers whatever their requirements. Why not have a qualified interpreter with you during meetings and negotiations and get the best prices and results for your business or transaction. I have represented clients in meetings with cabinet makers (for importers) to cabinet ministers (for politicians) and every level of business between. If you require my services over longer periods or indeed overnight/multiple days are possible on a bespoke basis. To contact me please click on the email below.